Robert Juliat is thrilled to have been awarded a prestigious PLASA Award for Innovation for its SpotMe a creative tracking system that works in association with followspots. 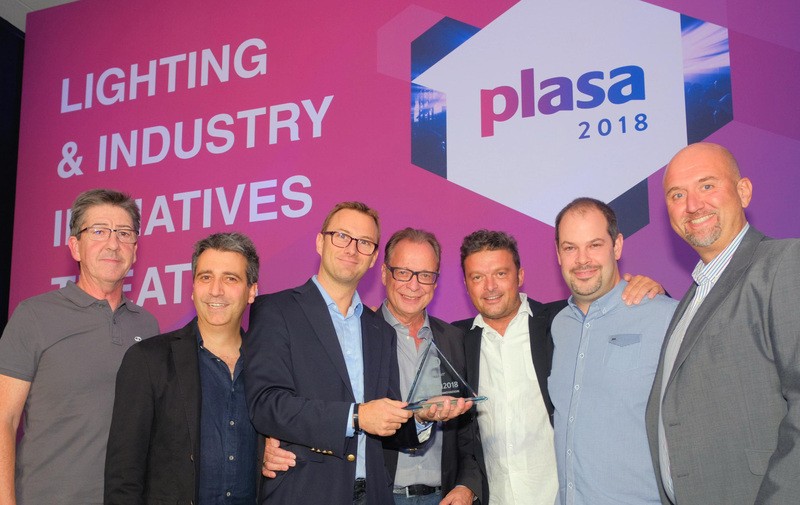 The Innovation Awards took place at the PLASA London show last week amid huge coMay 2018. SpotMe is Robert Juliat’s bespoke, 3D tracking system for followspots and the only performer tracking system to be driven via a real followspot. The SpotMe system communicates the X, Y, Z positions and the beam size parameters to the console. All parameters are then used by the console to control any automated or static lights, and coordinate stage lighting to follow performers, without the need for on-stage/performer sensors or cameras. It is a unique bolt-on system that can be added to existing followspots without the need to invest in complete new systems. SpotMe is a genuine and unique solution which combines high-technology and human control over the lighting design and operation at the same time. With SpotMe, the technology serves designers and operators with a special care for the artistic aspects. Its innovative system uses advanced algorithms and calibration to interpret information sent from its onboard sensors to communicate with any console or devices using PosiStageNet protocol. The console or device can then coordinate the identical movements of other fixtures in the rig, even conventional fixtures with no feed back capability. In addition, SpotMe can be used to set limits to avoid light spill into scenic or public areas, while iris movements can be converted into any other function, such as control of the beam size. Quick and simple to set up and operate, SpotMe has universal application that can be used anywhere in the world. SpotMe drew huge attention on the stand as it was demonstrated in conjunction with RJ’s Oz 600W LED long-throw followspot. The highly efficient LED source ensures Oz and Alice, its short-throw equivalent, deliver a punch equal to that of conventional 1200W discharge models, at a fraction of the power consumption. The SpotMe system is compatible with all Robert Juliat followspots from the Touring, Grand and Compact ranges. Continuing on the awards front, Robert Juliat was a proud supporter of the 11th Knight of Illumination Awards which took place at the Eventim Apollo, Hammersmith on the first day of the show. Robert Juliat sponsored the Robert Juliat Award for Opera which was won by Fabiana Piccioli for Eugene Onegin at Scottish Opera. Robert Juliat would like to congratulate Fabiano, and all the worthy KOI winners and nominees that make our industry such a hive of creativity.